For the span of its existence, the sport of football has had a love-hate relationship with with the public. It can be a dangerous game, requiring players from Pop Warner to the pros to put their bodies on the line for the good of the team. But it's also a perennial favorite for fans and players alike. Football provides specific advantages and disadvantages to those who play it, no matter what level they play. One of the reasons that football is such a prevalent sport at high schools across the United States is that the sport instills an intense sense of teamwork to accomplish a common goal. The lessons of shared responsibility, of each player putting his body on the line for the benefit of his teammates and that selflessness are important lessons learned from playing football, especially at the youth level. Football is a physically demanding sport, no matter what position you play. It requires strength, speed and agility, and many football teams train year-round. Training for football involves strength training, drills that develop forward, backward and lateral agility, cardiovascular fitness and overall endurance. In-season training is often a six-day-per-week program that also includes significant practice time. Offseason training often involves three to four days per week of training, with a greater focus on improving strength and endurance and less on football-specific drills. Football training is an excellent, total-body method for getting in and staying in shape, as long as you don't get injured. The major disadvantage to playing football is the high risk of injury. 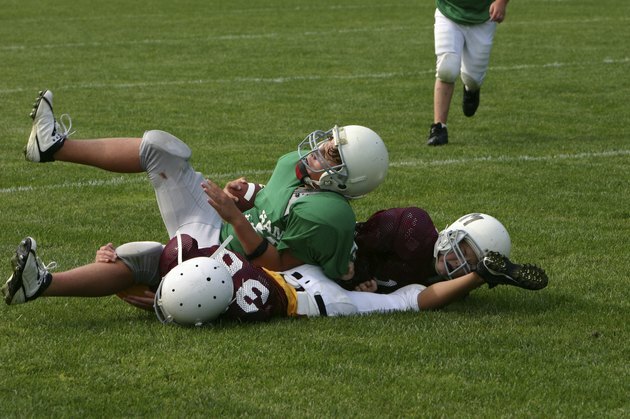 Even with every possible safety precaution followed to the letter, scrapes, bruises, sprains, joint dislocations, broken bones and concussions are all possible on any play. Although the rules of most leagues at every level make a concerted effort to mitigate the risk of any of these injuries, the physical and often violent nature of the game make it difficult to remove entirely. Such injuries can be painful and may require significant time for rehabilitation. Another disadvantage to playing football is that the sport requires a significant commitment of time. Often, during the season a player's schedule revolves entirely around the team -- practices, gym workouts, games, film breakdown -- and it makes life considerably more hectic. Also, many of the other things you may want to do often have to take a backseat to football, because the team depends on each player to give total dedication to the process.